A century ago, Fort Columbia guarded the mouth of the Columbia River from would-be invaders, with fierce guns and a string of underwater mines that stretched across the river. The fort's massive fortifications and two old guns have been preserved in what is now a Washington State Park. With the deep-forest wilderness of Scarborough Hill above the structures, Fort Columbia represents one of the finest recreational opportunities of the lower Columbia River. Construction of the fort began in the late 1890s during Spanish-American war. It was completed by 1906 and was manned in both world wars but never saw actual combat. In 1951 it gained state park status. Today a tunnel takes travelers underneath the fort on Highway 101, a road that was originally built on wooden trestles around the point of land where the fort is located. Some of the original pilings can still be seen today. Anyone with children should start their visit by touring the four old gun batteries and bunkers, with their dark, subterranean rooms perfect for exploration. The concrete-mounted gun batteries which are sighted out over the wide Columbia spur the imagination. 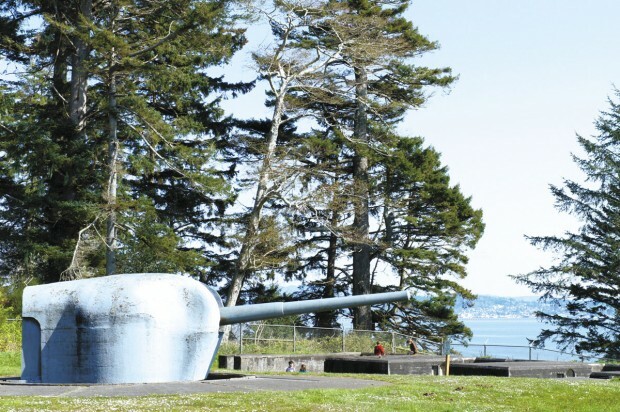 Most of the big guns that guarded the west coast during WWII were melted down or moved to more critical locations, and only half a dozen of them remain in the world. Two of them are here, and you can peer down the long barrels that could fire 105-pound shells 15 miles out into the Pacific. Stroll along boulevards of the housing area's stately officers' quarters, some of which are available as vacation rentals. A small theatre is often used for musical and theatrical performances. The fort's interpretive center and commanding officer's house are closed until further notice because of budget constraints. The park includes more than a military installation, however. The wild woods beckon hikers to head up to the imposing peak of Scarborough Hill, named for the man who settled here more than a century ago and reportedly left a treasure buried somewhere in the depths of the forest. Searching for lost treasure amid the tangled jungle and in crumbling buildings and bunkers will keep kids happy, and the ancient trees and peek-a-boo views of the Columbia Bar and the Pacific Ocean will keep necks craned and cameras clicking. An abundance of spring flowers may add color to the woods. From the lower parking lot, the Scarborough Trail is 1.2 miles to the summit of Scarborough Hill at 780 feet elevation (thick forest blocks all but occasional glimpses of blue sea and sky). The Military Road Trail takes off from the upper parking lot and reaches the summit in a slightly shorter 1 mile. There are two spur roads connecting these two trails for those who want to make a shorter loop. For the longest hike, take the Canyon Creek Trail, also from the upper parking lot 1.6 miles to the summit. All these trails have short side trails that lead to hidden bunkers, some dark and decaying and requiring care while exploring. After exploring the bunkers and batteries and hunting for buried treasure, stop at the small beach near the entrance to the park. It's a nice place to relax, especially at low tide. If you're lucky, it will give you a ringside seat for watching a vivid Pacific sunset. Fort Columbia State Park is 2 miles west of the Washington end of the Astoria-Megler Bridge. The entrance is just west of a tunnel on Highway 101. The park is open daily. A Discover Pass is required for entrance. Though maps of the hiking trails may not be available at the trailheads, junctions are well marked with signs. If in doubt, just head downhill and you'll get pack to the parking lot. The best account of Fort Columbia and what it has to offer visitors that I've seen! Can't wait to visit Fort Columbia again and take a more thorough look! Thanks for the tips.